This recipe is presented as written by Maida except for a few observations of mine that I have placed in parentheses). Spectacular! Stark—simple—dramatic. As smooth as honey, deliciously custardy, extremely chocolate (but not heavy), with a rum and espresso flavor. The cake cuts like a dream. It is huge (2 ½-inches high), and should be made a day or tow before serving. Everything about this makes it the perfect dessert for a large and important party. You need a 9-by-3-inch springform pan. Adjust a rack one-third up from the bottom of the oven and preheat the oven to 375 degrees. In the bowl of a food processor fitted with the metal chopping blade process the macaroons until the crumbs are about as fine as graham-cracker crumbs. Transfer the crumbs (or graham-cracker crumbs) to a mixing bowl. Place the nuts and sugar in the processor and process until rather fine (although slightly visible pieces of nuts may remain – they add a nice crunch to the crunch). Transfer to the bowl of crumbs and mix well. Add the melted butter and stir to mix and to moisten the crumbs evenly (the ingredients will not hold together). The sides should be fastened to the bottom of a 9-by-3-inch springform pan (both parts unbuttered). Turn the crust mixture out onto the bottom of the pan. With your fingertips distribute the crumbs evenly all over the bottom. Then, with your fingertips, press down on the crumbs firmly to make a compact layer on the bottom only. )To smooth the layer, you can cover it with a pieces of plastic wrap about 10 inches long, and then place an 8-inch layer-cake pan on the plastic wrap and press all over. Remove the pan and the plastic wrap). Bake for 8 minutes. Set aside and let cool. Then place the pan in the freezer; the crust should be cold for the next step. Cut the chocolate into small pieces and place it in the top of a double boiler over warm water on low heat. Stir frequently until melted and smooth. 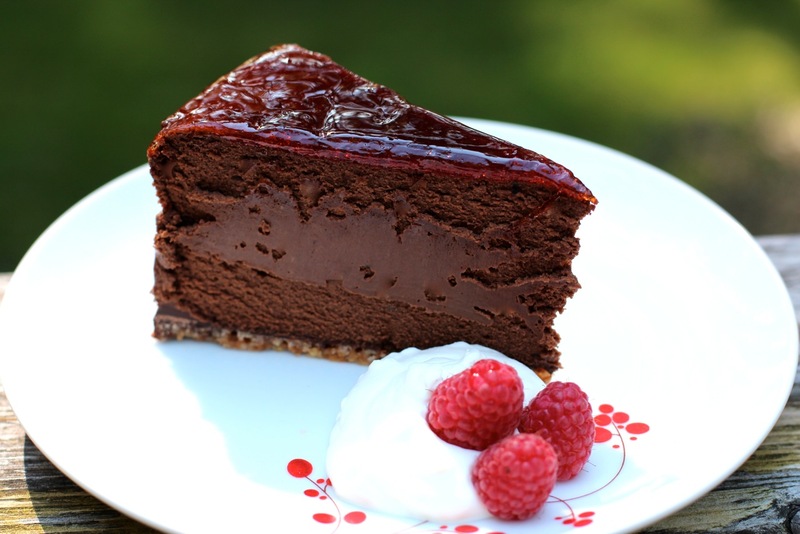 Remove from the heat, pour the melted chocolate over the cold crust, and before the chocolate sets, spread it with the bottom of a teaspoon all over the crust, stopping about ¼-inch away from the edges. Let stand until firm; if necessary, replace in the freezer to set the chocolate. 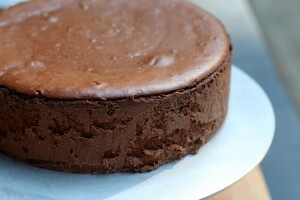 (This layer of chocolate will protect the crust and keep it crisp; aside from adding additional chocolate flavor). Now butter the sides of the pan carefully with a pastry brush and melted butter (using additional butter to that called for). The cake will bake in a larger pan of hot water. To be sure that no water seeps into the cake pan, it should be wrapped carefully in a double layer of heavy-duty aluminum foil as follows: Tear off two 18-inch lengths of the foil. Place one on top of the other. Place the cake pan in the center of the foil. Be very careful now not to tear the foil (even a small hole would allow water through). Carefully bring all the sides up around the pan, and gather the excess together at the rim of the pan. With scissors cut away the foil that extends above the rim of the pan. Press firmly all around the pan to make the foil fit as close as possible. Set aside. You will need a pan larger than the cake pan but not deeper for the hot water; just have it ready. One a board, with a long and heavy knife shred/chop the chocolate fine. Place it in the top of a large double boiler over warm water on low heat. Cover the pot with a folded paper towel (to absorb steam) and the pot cover. Let cook until almost completely melted. Then uncover and stir until completely smooth. Remove the top of the double boiler and set aside, uncovered. In a 1-quart saucepan over moderate heat scald ½ cup of the cream (reserve remaining 1 cup cream). When you see a wrinkled skin on top, strain in the cocoa, espresso or coffee powder, and salt. Whisk until smooth. Cook for a few minutes, stirring constantly. Then remove from the heat and stir in the rum and the remaining 1 cup of cream. Set aside. In a small bowl beat the eggs lightly just to mix and set aside. In the large bowl of an electric mixer beat the cheese until it is completely soft and smooth. There must not be any lumps in the cheese. It is best to remove the beaters once during mixing, scrape them clean with a fingertip, then replace them and continue beating. Add the sugar and beat, scraping the bowl occasionally with a rubber spatula, until the mixture is perfectly smooth. Then add the chocolate and, without waiting, on low speed gradually add the cream mixture, and finally the eggs. While beating, frequently scrape the bowl with a rubber spatula. After adding the eggs beat as little as possible. Turn the mixture into the prepared pan, pouring it over the crust. It will fill the pan almost to the top. Gently rotate the pan a bit in opposite directions to level the batter; do not be so rough that the mixture clings unevenly to the sides of the pan. Place the cake pan in the larger pan. Add ½ to 1 inch of hot water to the larger pan. Bake for 1 hour. The turn off the heat and let the cake stand in the oven with the oven door closed for 1 hour. The remove the cake pan. Carefully remove the foil wrapping. Let the cake stand in the pan on a rack at room temperature for several hours until the pan is completely cool. 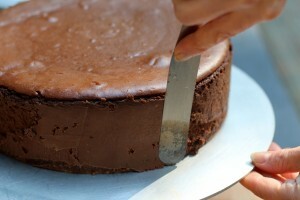 With a small sharp knife cut around the sides – all the way to the bottom – to be sure the cake and/or crust are not stuck to the sides of the pan. Then release the spring and remove the sides. If necessary, smooth the sides with a small, narrow metal spatula. Place the cake (still on the bottom of the pan) on a cookie sheet or a small board (for ease of handling) and refrigerate uncovered overnight. (Below you can see the cake unmolded. The sides might not be as smooth as you like). (You can easily smooth them out using a just dampened icing spatula). To remove the cake from the bottom of the springform, insert the tip of a wide, heavy, sharp knife at one edge of the crust. Cut all around the crust. Gently raise the knife to release the crust from the pan. Then, with a wide metal pancake turner or using a flat-sided cookie sheet as a spatula, transfer the cake to a serving plate or a cutting or serving board and glaze the top of the cake. In a small pan over moderate heat stir the jam until melted and smooth. If necessary, add a few drops of water to help melt the jam. The boil briefly to reduce. 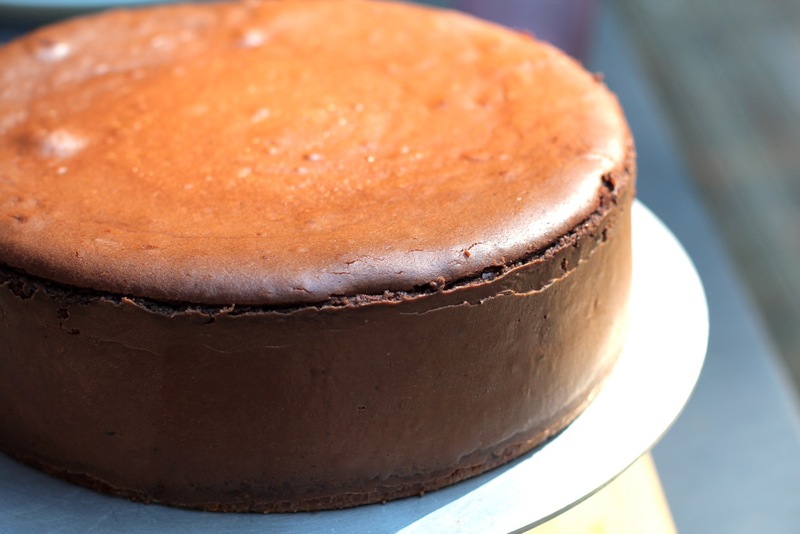 Brush a generous layer all over the top of the cake. Bruch on two layers if you wish. Gorgeous! Refrigerate until serving time. It is necessary to use a hot and wet knife for serving this. Use a string, heavy, sharp knife, with a blade preferably 8 or 9 inches long. Either work in the kitchen and hold the knife under hot running water or dip it in a deep saucepan of boiling water before making each cut. Or, to serve this in the dining room, have a deep pitcher of boiling water and dip the blade before each cut. This may be served as is. Or, preferably, with soft whipped cream and fresh raspberries on the side.